Many Christians struggle with the dark shadows depression can cast over our lives. Too often, our depression is compounded by a sense of personal shame or guilt. 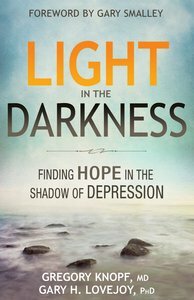 Light in the Darkness shows us how, rather than a sickness or a sin, depression is actually a signal, warning us of emotional damage that needs repair. Here, readers will find a blueprint for restoring emotional health and rekindling the hope of faith that is both biblically and psychologically sound. About "Light in the Darkness: Finding Hope in the Shadow of Depression"
DR. GREGORY KNOPF has been a family practice physician for 24 years and is the founder and clinic director of the Gresham-Troutdale Family Medical Clinic. A graduate of Oregon Health Sciences Medical School, he specializes in the treatment of depression.